r1 = r2 * 0x51EB851F; // take upper dword only. (0x51EB851F is the lower dword of 3.14 in IEEE double, and also 237/100+1) Can someone explain what this code is doing? Why are they doing things like this is beyond me. I was not updating last few days because I wanna clear all the homework first. Anyway, there's no major update about ⌘, but there is a huge addition in 5-Row QWERTY. 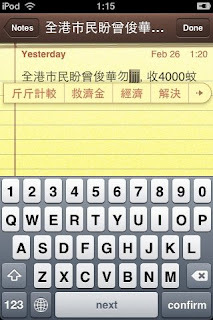 Totally customize the special characters, e.g. change the ^ to ?, $ to €, etc. There are a few bug fixes and improvements as well, which are recorded in the ChangeLog as usual. iKeyEx 0.1-7 is a minor update which addresses a few bugs. However, the critical one still has not been fixed because no one has ever given me a crash log or a useful crash log. Although the layout engine of 5-Row QWERTY only depends on 0.1-6, the preferences binary depends on a single 0.1-7 function "iKeyEx_KBMan" for clearing the cache quickly. Therefore you still need to upgrade iKeyEx to make it work. Open UIKit (2.2), and search for UIResrouceBundleForNIBBeingDecodedWithCoder. Lol. Now that UILabel is all set, I continue to hook other texts that are long enough to be "commanded", e.g. 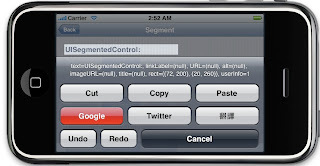 the UITableHeaderFooterView. There are also some reluctant UILabel that refuses to be hooked. For these I hooked their superviews (UINavigationBar & UIPickerTable) for extracting the text info. And here comes the real challenge: hooking the UIWebDocumentView. Yes I knew the Clippy 0.95-5 experiment was failed. But this does not prevent anyone else from finding another way to achieve the same goal right? and like Clippy 0.95-5, it crashes immediately at the 2nd touch. If I trace the class of the returned object*, I can see the class changes from e.g. DOMHTMLAnchorElement to NSCFType. In fact I encountered this before once when trying to implement setSelection() to <textarea/> and <input/> in ℏClipboard using the DOMRange object. It fails on the 2nd call. I call this the "observer effect". Right after you "observed" any DOM objects, the object will "collapse" and you can't reference it reliably anymore. A workaround is to -retain it right after the DOM object is accessed. But this introduces memory leak. This is really a last-resort option. And actually it turns out to be work done too complicated. There is a -[UIWebDocumentView approximateNodeAtViewportLocation:] method in the Interaction category which can easily be overlooked. It returns a DOMNode without any observer effect AFAIK. Except it crashes on 2.2 complaining ASSERTION FAILED: !WebThreadIsEnabled() || WebThreadIsLocked(). Well that's easy enough to solve. Just lock the WebThread() everytime we need to access this method. and done! The DOMNode is got and we can do anything we want. Too good to be true. Turns out the DOMNode will only be returned on any objects that have actions, i.e., <a>, <input/>, <textarea/>, <img/>, any thing that has onXXX events, but not static texts. If touchPoint is on a static text, nil will be returned. So, at the end of Day 2, I can hook to any DOMNodes, besides UILabel, UITableHeaderFooterView, UINavigationBar and UIPickerTable. Note: -[WebView elementAtPoint:] returns a subclass of NSDictionary. By the returned object I mean the value corresponding to the WebElementDOMNode key. OK, now iKeyEx 0.1-6 has been released, let's turn into the other project left over: ⌘. ⌘ was proposed on Jan 26th as a solution to issue 10. You can read the design concept here. As I develop the app, I'll keep updating the progress on this blog. where forwardMethod2() is equivalently the statement [[self nextResponder] performSelector:_cmd withObject:touches withObject:event]. This pattern is used for all touchesXXX:withEvent: messages. Now since I have renamed the old touchesBegan:withEvent: for UILabel only, and my code forwards the message to the next responder (the UIScrollView), and it does not recognize old_touchesBegan:withEvent: -- blam, crash. With this, I can hook all UILabels in the simulator. 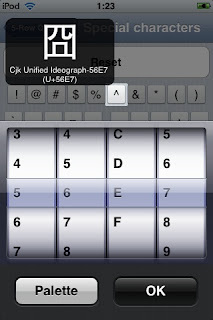 I've sent the latest versions (r167) of iKeyEx, ℏClipboard, 5 Row QWERTY, L33tTyper and MathTyper to the BigBoss. Hopefully they'll be available tonight. 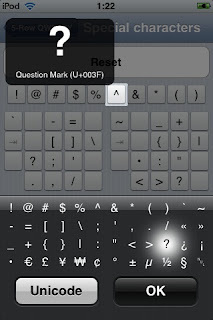 5 Row QWERTY 0.1-6 is released, and iKeyEx is also upgraded to 0.1-6 to support the features of it. I've put up a few cached images of the new layout at http://code.google.com/p/networkpx/wiki/Using_5RowQWERTY. BTW, if there's no more blocking issues, the new versions of iKeyEx, ℏClipboard, 5 Row QWERTY, MathTyper and L33tTyper should hit BigBoss tomorrow morning (GMT+8).